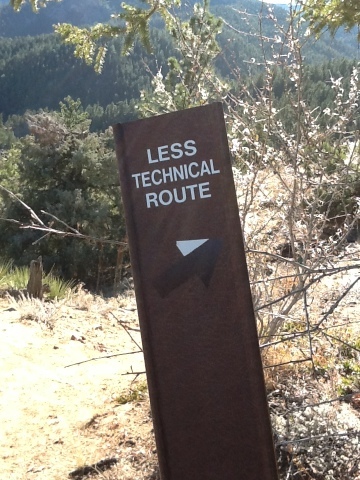 On a recent hike in Colorado I came upon this funny sign which, for whatever reason, reminded me of Robert Frost’s poem The Road Not Taken. That night I could not help but re- write on a cocktail napkin as I sat, glad that I had in fact had taken The Trail Less Technical. Realizing the wise choice that I did make. This entry was posted in Western Hikes and tagged Boulder hikes, Walkers ranch loop trail. Bookmark the permalink.